If you Google boundless energy, friendliness, and dripping with angling talent, you will come up with her name. Her achievements, so far, are already the stuff of a legend, and she has been recognized as such by the Hall of Fame committee of the Fly Fishing Museum of the Southern Appalachians. Her induction ceremony date will be announced shortly. Wanda is the world’s first woman to become a Master Certified Casting Instructor by the International Federation of Fly Fishers. 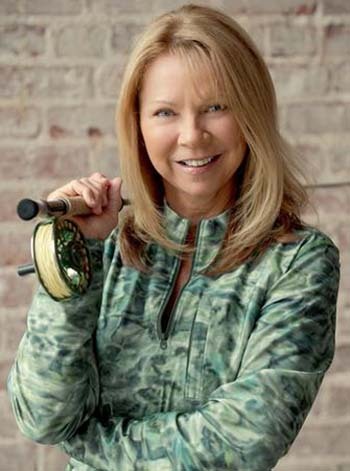 She is also the owner of Wanda Taylor Fly Fishing School. • She is the first woman Orvis endorsed as a guide in the Southeastern United States. • She was awarded the Southeastern Federation of Fly Fishers 2005 Woman of the year award. • She received the 2008 Federation of Fly Fishers Southeast Council Award of Excellence for her work with breast cancer survivors with Casting For Recovery, Georgia’s Casting For Confidence and her teaching and testing activities for the Federation of Fly Fishers Certified Casting Instructors program. North Carolina and South Carolina’s “Casting Carolinas” with Starr Nolan, a free fly fishing retreat for women with all types of cancer.